Teachers can contact us at info@ConstitutionQuest.com for school discounts. We accept purchase orders! Constitution Day/Week begins September 17th! Celebrate the 232nd anniversary of the signing of the Constitution! The most FUN, EASY, & EFFECTIVE way to LEARN the U.S. Constitution! Constitution Quest is hailed by scholars everywhere as the most fun and easy way to learn the U.S. Constitution. Includes: - Constitution Quest game board - Constitution Quest Game Play, Rules, and Directions - Constitution of the United States and Declaration of Independence booklet (for reference) - 1 set of (2) dice - 10 game piece portraits (Featuring 10 of the 39 Constitution Signers) - 4 game piece stands - Constitution Quest Answer Key - Pencil - Score Pad - 5 Constitution Quest card decks (223 cards in all) The game is best played by 2-4 individuals or teams, ages 10+, and rules are included for younger audiences 7+ as well. Take your friends and family on a fun-filled dash around the three branches of American government in less time than it takes to watch a TV show. 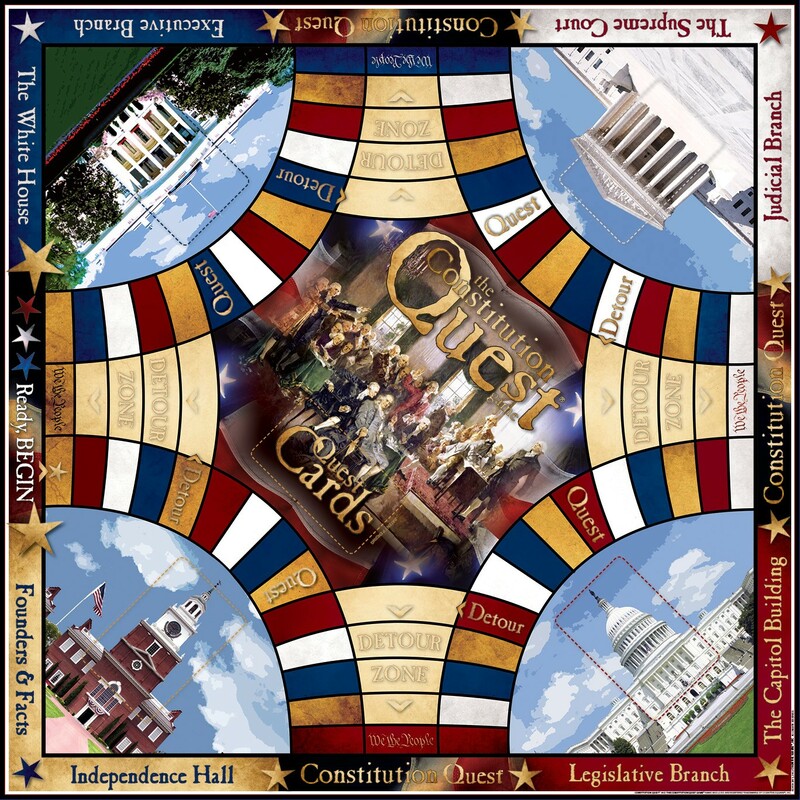 Players race around the beautiful, red, white and blue game board, earning points for questions that teach all the Articles and Amendments as you play. The game is full of twists and turns, wild cards provide checks and balances, and the only way out of detours is through “We, the People.” Studying the US Constitution has never been this fun or easy. The 223 game cards covering every Article and Amendment reinforce the value and relevance of the entire Constitution.